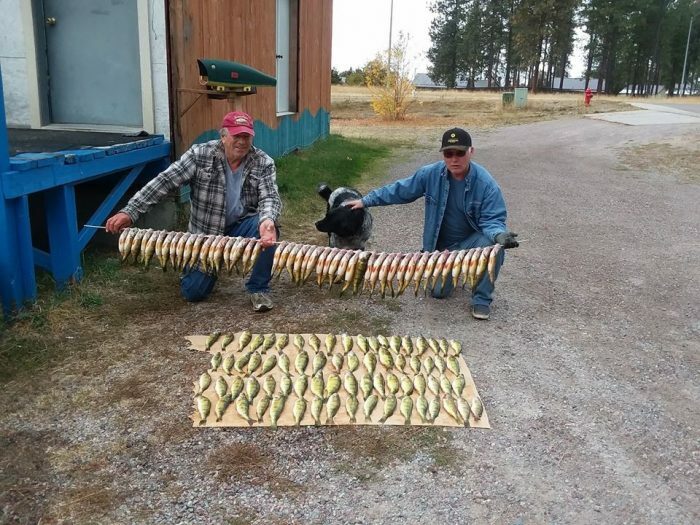 With hunting season and the Mack Days contest in progress people forget fall perch fishing in Flathead lake. With winter coming on their activity level is heightened close to what it is during their spawning season in East Bay in the spring. In fact a fisherman who has been fishing in a 35 to 40 feet depth in front of the North Elmo Access said he thought it was every bit as good as the spring fishery. Keith Ryland and I headed out there yesterday October 8 late in the day knowing we’d only have a couple of hours to fish at most. See Picture. Once in the water I began watching the fish finder for depth mostly. At 36 feet I saw a school of fish. So we dropped the anchor as quickly as possible. Nonetheless the wind blew us back into a 32 foot depth which seemed not to hold fish. Casting up wind into deeper water brought immediate results. We lifted the anchor and motored up wind beyond where the fish were and reset the anchor. From then on it was non-stop action with multiple doubles. (If you hesitate, when you first feel a bite, instead of setting the hook right away it increases your chances of bringing in two rather than one fish at a time. We were using either two fuzz bugs or 2 “smile” hooks above a bottom weight baited with night crawlers or cut bait. With the sun beginning to set and our cooler ¾ full of nice sized perch with some real jumbos included, I thought “what a satisfying afternoon this has been”. Last fall I was still getting good numbers of perch toward the end of November. So you should have plenty of time to take advantage of this great fishery. Chancey at Snappys Sports Senter reports that the whitefish have already moved into the river above the North end of Flathead Lake. If you didn’t get your fill of these big bruisers this summer this is your chance to get another shot at them.